These generous dividend yields look sustainable. Many stocks with above-average dividend yields come with above-average risks. Yields are often high for a reason, reflecting pessimism on the part of investors. But that's not always the case. Three of our Motley Fool contributors have identified Alliance Resource Partners (NASDAQ:ARLP), Hanesbrands (NYSE:HBI), and MPLX (NYSE:MPLX) as high-yield dividend stocks worthy of your investment dollars. Here's why. Sean Williams (Alliance Resource Partners): There are high-yield dividend stocks, and then there are income stocks in an entirely different bracket. That's where I place Alliance Resource Partners and its 10.3% dividend yield. Now, I know what you're probably thinking: "Why on Earth would I consider investing in a coal stock?" In most cases that would be a viable question, and the correct answer would be "You wouldn't." That's because wholesale coal prices have been depressed, and domestic demand has been declining as a result of energy utilities switching to cleaner-burning natural gas to generate electricity. Plus, most coal companies leveraged themselves to the hilt and are thus buried in debt. But Alliance Resource Partners isn't your typical coal company. Rather than aimlessly expanding, its management team has chosen to grow conservatively. At the moment, the company has less than $470 million in net debt, and a total debt-to-equity ratio of just 41%. This is considerably lower than its peers, which gives Alliance Resource financial flexibility that other coal producers simply don't have. This is also a company that prides itself on thinking ahead. As of the second quarter, it had secured price and volume commitments for 24.7 million tons of coal in 2019, 16 million tons in 2020, and 6.7 million tons in 2021. For context, the company typically produces around 40 million tons of coal per year. The more commitments it secures ahead of time, the less chance it'll contend with volatile wholesale-price fluctuations, and therefore the more predictable its cash flow. Alliance Resource has also mitigated demand weakness in the U.S. by looking overseas (specifically, in Asia). The company has increased its international exposure from 4.5% of total sales volume in 2016 to an estimated 27.2% in 2018, based on the midpoint of its production estimate for this year. With a growing focus on exports, demand really isn't an issue. In other words, this is a top high-yield stock with what looks to be a fully sustainable 10% yield. Tim Green (Hanesbrands): Apparel manufacturer Hanesbrands hasn't gotten much love from investors over the past few years. The stock has been steadily declining since early 2015, and recent negative developments haven't helped. Target's decision earlier this year to end a major contract for an exclusive line of athletic apparel sent the stock tumbling, and the company's third-quarter results were hurt by the bankruptcy of Sears Holdings. Despite these setbacks, there's a lot to like about Hanesbrands. The company's Champion brand of athletic apparel grew by 30% adjusted for currency in the third quarter, and it grew by 40% excluding mass-market retailers. International sales are also growing, up 11% in the third quarter. The profitability of the international segment is improving, which is helping to offset weaker sales of Hanesbrands' innerwear products. The company did lower its full-year adjusted earnings guidance to a range of $1.69 to $1.73, a reflection of the Sears bankruptcy and a stronger U.S. dollar. But the stock trades for less than 10 times the midpoint of that range. The $0.15-per-share quarterly dividend is good for a dividend yield of 3.5%, and it eats up just 35% of expected earnings. Things would have to go very wrong for the dividend to be at risk. Hanesbrands isn't an exciting stock, and its overall growth is slow. But with a solid dividend yield, a low payout ratio, and time-tested brands, the stock is worth considering. Tyler Crowe (MPLX LP): In theory, master limited partnerships were designed to be high-yield investments with some tax advantages that would make them great stocks for income investors. To do that, though, these companies need management to do a few things incredibly well: build or acquire new assets at good valuations, grow the payout, and maintain discipline when funding those new assets. Not every management team in its industry has done that well, but so far MPLX has shown to be one of the few built to deliver returns for years to come. For an investor looking for a reliable income stream or a long-term wealth-building investment, MPLX has lots of qualities you would want. One is that it has a massive pipeline for growth. On top of the $2.2 billion it plans to spend in 2018 on new assets, the oil and gas infrastructure industry will need about $800 billion in new investments over the next few years. Even better, though, is that the company continues to generate more than enough cash from operations to help fund that growth, and keep those paychecks coming to investors. In the most recent quarter, MPLX's distribution coverage ratio -- total cash available to distribute divided by total cash paid out -- was 1.36, which leaves plenty of cash for investment and helps MPLX maintain one of the most conservative balance sheets among its energy infrastructure peers. 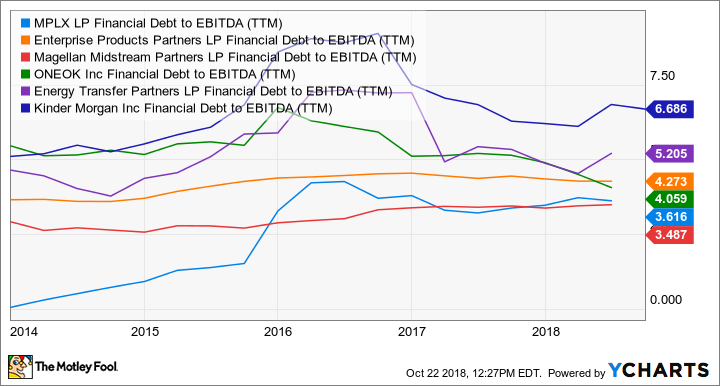 MPLX Financial Debt to EBITDA (TTM) data by YCharts. With a conservative approach to debt, a track record of growing its earnings and payouts in a sustainable fashion, and a distribution yield north of 7% today, MPLX is a high-yield stock that investors should take a look at now.